Schnapps is a type of distilled spirit that has two meanings. Essentially, true schnapps is made by fermenting fruit juices along with the base liquor. In this sense, schnapps is considered a fruit brandy or eau de vie. The result of this schnapps process is a stronger and often clear distilled spirit, much like a lightly-flavored vodka. In contrast, schnapps in the United States is often used to describe a category of sweetened, fruit-flavored liqueurs (there are exceptions to the fruit). Instead of distilling the fruit, liqueurs are often made by steeping fruits in alcohol after fermentation and/or distillation. As we often see with these varieties of schnapps, flavor and color additives are frequently added. That is a step you will not find in authentic schnaps. The German word for schnapps drops one 'p' and translates into English to mean hard liquor, booze, and the like. Schnaps is used to describe any strong distilled spirit, particularly those of at least 32% ABV (64 proof). The word also comes with a loose translation of snap, referring to the strength of the spirits. While schnaps can technically refer to any liquor, it is often used for fruit brandies distilled from fresh fruit juices. These are often called Obstler, or fruit schnaps. Apple, apricot, cherry, pear, and plum are the most popular flavors and many distillers grow their own fruit for their schnaps. Schnaps is most popular in Germany, where it originated for medicinal uses. Austria, Denmark, and Switzerland are also big on the schnaps. European drinkers rarely mix their schnaps into cocktails, opting instead to enjoy it straight out of the bottle and often before or after a meal. In the United States, schnapps is used to describe a category of liquors that have often been on the lower end of the quality spectrum. There are exceptions and good schnapps can be found at a higher price. These spirits are often drier than their sweet liqueur counterparts. For example, peppermint schnapps is not as sweet as creme de menthe. They are flavored with a variety of fruits and spices. The alcohol content of these schnapps can range between 15% and 25% ABV (30 to 50 proof) depending on the brand. This is significantly lower than the German definition of schnaps. Some schnapps use a mix of flavors, others can be considered outlandish, and a few can be tart, bitter, and not the best to mix with. Schnapps come in a great variety of flavors and they are fun to use in mixed drinks. Apple, butterscotch, cinnamon, peach, and peppermint are by far the most popular schnapps flavors in the bar. If you're looking for the German equivalent to schnaps in the U.S., seek fruit brandies instead. 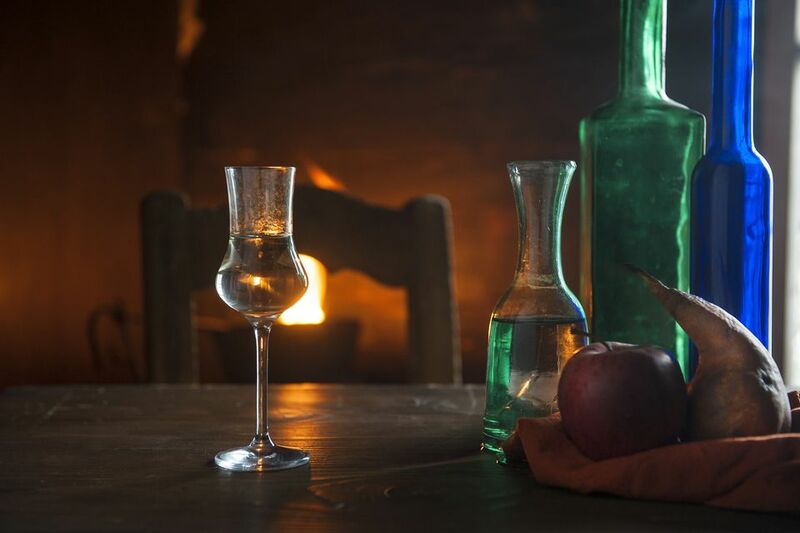 Many craft distillers are producing excellent bottles of apple, apricot, and other flavored brandy that rival many European schnaps. Do be wary of 'brandies' that have sweeteners, these are not true brandies and are instead liqueurs (or closer to the American definition of schnapps). Even in this category, all schnapps are not created equal and you often get what you pay for. Shop smart and fork over a few extra dollars to improve your drinks.